North Korea has suspended access to the Kaesong industrial zone shared with the South – the latest move amid escalating tensions on the peninsula. South Korea’s defense minister warned that all options will be considered if worker safety is at risk. South Korea’s Unification Ministry reports that 446 South Korean workers have been stranded at the Kaesong facility, waiting to cross back into home territory since the early hours of Wednesday. Normally, daily entry clearance is given via telephone. 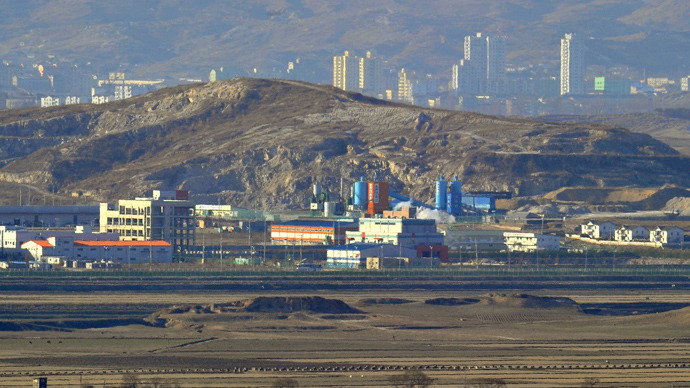 There are a total of about 860 South Korean workers in the Kaesong zone. One hundred and seventy-nine South Korean staff showed up at the border on Wednesday morning, but North Korea also refused to let them in. North Korea could be making good on an earlier promise to close off the complex as part of the increasingly bellicose rhetoric exchanged between the two countries, also involving Washington. The US, the South’s key ally, has been responding to Pyongyang’s threats with counter threats and a military build-up, deploying strategic nuclear-capable bombers and advanced guided-missile destroyers in the region. The United States sees a “real and clear” danger from North Korea, given its nuclear and missile capabilities and bellicose rhetoric, US Defense Secretary Chuck Hagel said on Wednesday. 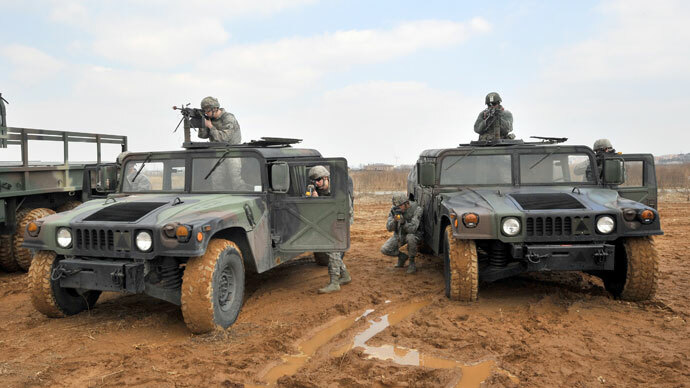 “We take those threats seriously,” Reuters reported quoting Hagel. “We are doing everything we can, working with the Chinese, others, to defuse that situation on the peninsula,” added. In response, South Korea’s Defense Minister Kim Kwan-jin said that all options are being considered, including military, if safety of South Koreans in the North is at risk, Reuters quoted Yonhap news agency as reporting. South Korea claims to have contingency measures in place for dealing with hostage situations in Kaesong, but their administration is keeping silent on what those might be. China, North Korea’s reluctant ally, called on all parties involved to show restraint. “In the present situation, China believes all sides must remain calm and exercise restraint and not take actions which are mutually provocative and must certainly not take actions which will worsen the situation,” Deputy Foreign Minister Zhang Yesui said after meeting ambassadors from the North, South and the US on Wednesday. The blocking of Kaesong may be Pyongyang’s response to criticism from US Secretary of State John Kerry, who on Tuesday called the North’s actions “dangerous” and “reckless”. Pyongyang has been ramping up its war rhetoric over the past few months. It carried out a third nuclear test in February, provoking widespread condemnation and a fresh round of UN sanctions. 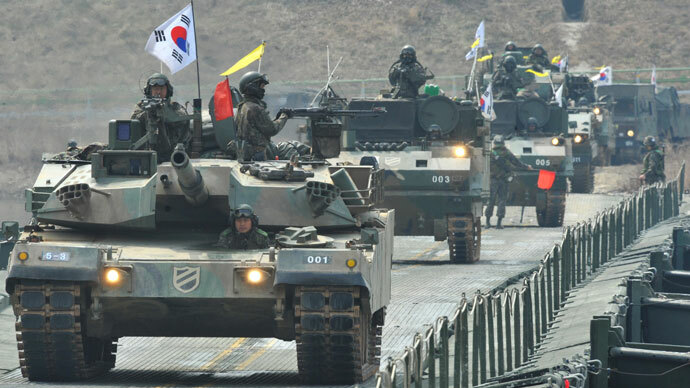 The current spike in tensions comes as the US and South Korea hold massive joint military exercises involving thousands of troops and advanced weaponry. North says those may be a clandestine way to prepare an invading force and pledges a military response towards any aggression. “With North Korea’s recent, what the US calls, “provocations”, it’s actually been easier for the United States to pivot its military into East Asia, something that the Pentagon had said it wanted to do. Because of this we’ve seen a larger presence by the US during these annual drills,” Seoul-based correspondent Joseph Kim told RT. Pyongyang said it would use its nuclear weapons arsenals against enemy troops and bases, if it is attacked. It also announced that it considers itself “under the conditions of wartime” and cut down hotline with Seoul. 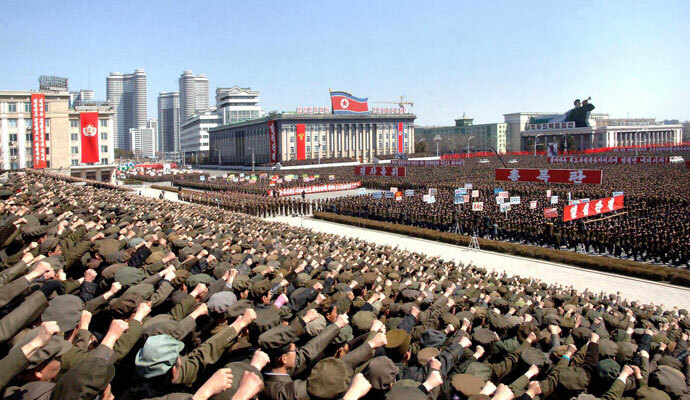 Observers however noticed no open signs of preparations for war in North Korea. “North Korea itself knows that if it did attack the United States, it would be committing national suicide. The United States would retaliate in a tremendous fashion. I believe that North Korea is doing all this to get to a point where it can actually negotiate some kind of peace agreement with the United States,”investigative journalist Tim Shorrock told RT. South Korea and Washington, for their part, threatened North with force. Their new plan for responding North Korea’s provocation now allows targeting not only the units directly involved, but also their commanders up to the highest level. The people of South Korea don’t seem to feel more threatened than usual by the current round of escalation. Pyongyang has a long record of using belligerent rhetoric and has a distinct style of using strong wording in its propaganda. “It’s not the first time North Korea issues threats, so we don’t feel threatened. We don’t perceive them to be dangerous. But it seems a lot of things is happening inside Kim Jong-un’s regime,” one young Seoul resident told RT. Most experts share the belief that North Korea will confine its current actions to threats. It seemingly does not wish to incur the military wrath of its adversaries, which would be disastrous for the nation. Many experts say that the young leader Kim Jong-un simply wishes to cement his reputation as a solid ruler. Kim has taken up office in December 2011 after his father’s death.